Preparation time: 15 minutes. Cooking time: 50 minutes. Heat oven to 400°F. Line a baking pan with nonstick aluminum foil (or use regular aluminum foil sprayed with nonfat cooking spray). Place tenderloin on a cutting board, and use a slightly oiled (olive oil) sharpening steel or boning knife to make a hole in the center of the tenderloin all the way through. Stuff dried apricots into the cavity, working from one end at a time and making sure to stuff them all the way into the middle. Place tenderloin in pan and sprinkle with black pepper, onion powder, and oregano. Cook for 45 minutes, or until a meat thermometer reads at least 160°F. 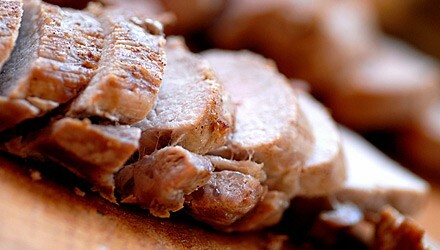 If you prefer your pork well done, cook until thermometer reads 170°F. Remove and let rest 5 minutes before slicing. While meat is resting, roll a collard leaf into a tight roll. Using a sharp slicing knife, slice into thin strips. Repeat until all of the greens resemble green ribbons. Heat oil in a large skillet over medium-high heat and add onion and garlic. Cook until onions are almost transparent. Add greens (which should still be damp) and sauté, moving rapidly until greens have relaxed and deepened in color, 2–3 minutes. If mixture starts to stick to the pan, add 1 tablespoon water. Remove greens from heat. To serve, place approximately 1 cup of greens on a dinner plate. Cut tenderloin into 1 1/2-inch slices. Place meat slices on top of greens. Serving size: 3 ounces of meat and 1 cup of greens. Exchanges per serving: 4 lean meat, 1 starch, 1 vegetable. Carbohydrate choices: 1.